What's going on under the table? The original design of the table was presented to the world by the Portuguese designer Goncalo Campos, taking as a basis the Bieder table from Emaf Progetti and filling the voids under it with an unusual installation. This composition is quite realisticThe situation that can take place under the table, in the form of cut silhouettes. 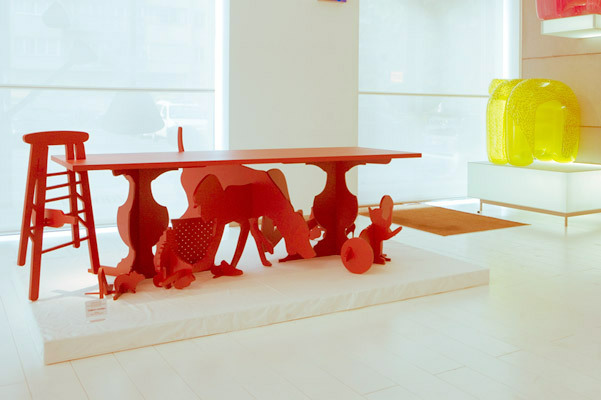 The conversion of the table supports the color solution and the concept of the original Bieder table, and the added profiles are very realistic: a child crawls under the table, sniffs something at the dog, a woman reaches for the shoe and various things are lying around. In addition to the visual component,The composition also performs the function of additional table support. This table can serve as a good illustration of how you can improve, transform and decorate ready-made furniture or interior items, seeing new opportunities in their appearance, presenting some situation and putting the idea into practice. Here's what the table looked like before: Well, it's after: Other works of the designer can be found at goncalocampos.